There are cameras that just take great pictures. And then there's the new Cyber-shot T300 from sony. Available in a choice of couture silver, black and red finishes, the T300 stands apart from others cameras with its svelte lines and audacious vertical-format styling. 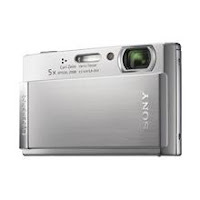 Looks apart, it's a powerhouse of advanced sony technology that makes it easy to shoot and share breathtaking images. Picture quality and responsiveness is assured by the high-speed Sony BIONZ image processing engine that improves the speed and accuracy of autofocus, exposure control, white balance, color adjustment and other functions.